This Saturday training is a good choice for those who commute from greater Portalnd or who ride the Max with two stations within blocks of the downtown Hillsboro classroom. 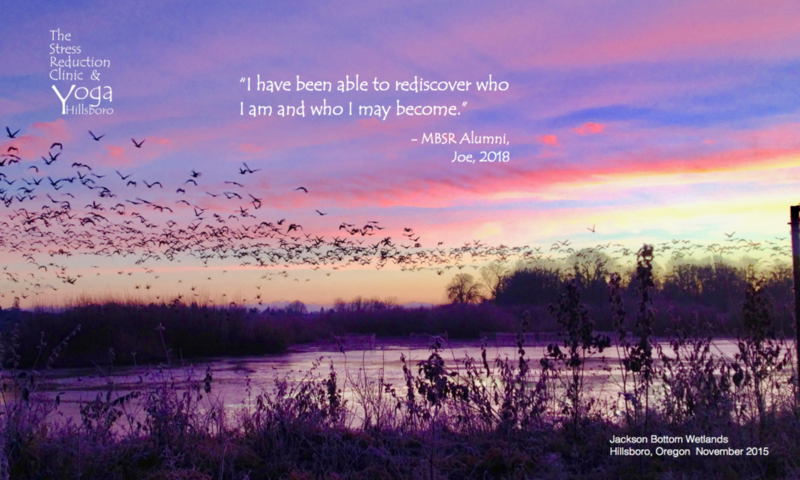 The 8-Week MBSR Program is an experiential learning course developed 30 years ago as a complement to self-care, medical care and therapy. 22 hours of class time (2.5 hours one day per week for 8 weeks). Meeting each Saturday, 2-4:30pm: January 19th through March 9th with these exceptions: Saturday, February 16th there is an extended class from 2-6pm. Also, the all-afternoon/evening Silent Retreat will be on Saturday, February 23rd from 2pm to 8:30pm. Tuition is $290 until one week prior to the first class for those who have completed the application and interview process. Thereafter the late tuition is $360. You will be Brant’s guest in his mindful yoga classes during the term as part of your home practice. Payment plans and partial scholarships might be arranged for those with limited means. Contact the instructor for details. If you are currently in active treatment with an acute condition consult with your doctor, therapist or psychotherapist to provide the MBSR instructor their written or emailed recommendation/referral for MBSR prior to the beginning of the course. You may be asked to give your doctor or psychotherapist permission to talk with your MBSR instructor in order to support you appropriately. Participants often do this to better include their healthcare providers as partners in the learning process. The MBSR training is held in the instructor’s well-equipped, safe and comfortable classrooms. To register for the program you must 1) complete a brief interview with the instructor and 2) complete and submit the application. Questions about MBSR? Learn more or contact the instructor. These MBSR Orientations are helpful though not required. Virundhu, 180 E. Main Street #105, Hillsboro OR 503-372-9628. Outstanding Southern Indian food.